Discover your tropical lifestyle in this affordable furnished 2 bedroom 2 bath upper level condo. Split master suites with large walk in closets. Screened balcony. Beacon 21 is a quaint boating community located within minutes to the river, beaches, shopping and dining. Priced to sell, second floor unit WITH GARAGE!Needs some TLC. Owner willing to rent back for 7 months, making it a great investor unit. Great amenities such as pool, fitness center, clubhouse, tot-lot, tennis, and more, make this great starter for the first time buyer. Centrally located, close to shopping and the beaches.in MARTIN COUNTY. Nicely tiled throughout. You can update to suit your taste. UPDATED 2nd FLOOR CONDO ! VERY SOUGHT AFTER & SELDOM ON THE MARKET ! BRIGHT OPEN SPLIT FLOOR PLAN WITH ENCLOSED BALCONY & MASTER BEDROOM BOTH OVERLOOKING TROPICAL SETTING. GOURMET STYLE KITCHEN, GRANITE, HURRICANE IMPACT GLASS WINDOWS, RAISED CEILINGS, CROWN MOLDING THROUGHOUT, DIAGONAL PORCELAIN TILE, LAMINATED WOOD FLOORS, SPECIAL LIGHTING, TANKLESS WATER HEATER, ETC. YOU'VE REALLY GOT TO SEE THIS FOR YOURSELF ! TREASURE COAST BEST KEPT SECRET ! LOCATION LOCATION LOCATION ! NO AGE RESTRICTED WATERFRONT COMMUNITY WITH RESORT STYLE AMENITIES WITH PRIVATE 50 SLIP MARINA ( 24ft. to 40ft. SLIPS FOR SALE OR RENT ), LARGE SWIMMMING POOL, CLUBHOUSE, EXERCISE ROOM, BARBEQUE/PICNIC AREAS, BILLIARDS/GAME ROOM, WORKSHOP, ETC. WITH A BUSY COMMUNITY SOCIAL CALENDAR ! MORE REMARKS SEE FULL SUPPLEMENT. WOW ! BEAUTIFULLY RENOVATED & UPDATED CORNER END 2nd FLOOR CONDO ! VERY SOUGHT AFTER & SELDOM ON THE MARKET ! PUT THIS ON YOUR MUST SEE LIST ! BRIGHT OPEN SPLIT FLOOR PLAN WITH EXTRA LIVING ROOM SIDE WINDOW & SCREENED BALCONY. NEW A/C & NEWER APPLIANCES. FULL SIZE WASHER & DRYER. FURNITURE AVAILABLE AND SEPARATELY SOLD. TREASURE COAST BEST KEPT SECRET ! LOCATION LOCATION LOCATION ! NO AGE RESTRICTED TRANQUIL WATERFRONT COMMUNITY WITH RESORT STYLE AMENITIES WITH PRIVATE 50 SLIP MARINA ( 24 ft. to 40 ft. SLIPS FOR SALE OR RENT ), LARGE SWIMMING POOL, CLUBHOUSE, EXERCISE ROOM, BARBEQUE/PICNIC AREAS, BILLIARDS/GAME ROOM, WORKSHOP, ETC. WITH A BUSY COMMUNITY SOCIAL CALENDAR ! MORE REMARKS SEE FULL SUPPLEMENT. Picturesque views of the St. Lucie River are sure to WOW in this tastefully renovated River Club condo. This 2 bed/2 bath retreat has been recently updated with laminate floors through out, a full kitchen renovation, both bathrooms updated, in-unit laundry, Impact glass line the St Lucie River views with accordion shutters across the front. River Club offers fantastic amenities including a community pool, fitness facility, marina and more! Close to restaurants and shopping in downtown Jensen Beach, downtown Stuart, and the beach! Dockage sold separately when available. Want a great view of the ocean? Come check this one out!!! Grab yourself a coffee, sit out on your balcony and watch the sunrise over the ocean!! Breathtaking!!!! All this and much more! Unit comes with new shutters, exterior doors and windows!!! Plus this lovely unit has tile floors throughout, new kitchen cabinets, microwave, garbage disposal and countertop, . It has also been freshly painted with a warm neutral color. This unit is move in ready and has so much to offer! A must see!!!! Own your own little piece of paradise!!! WALK OR RIDE YOUR BIKE TO THE BEACH! 3 large bedrooms with their own bathrooms-space galore! Impact windows, updated with hardwood floors in the bedrooms and stairs, plantation shutters, fully and exquisitely furnished. Just bring your swimsuit and sunscreen. Short jot to downtown Jensen with dining, shopping & entertainment! Monthly HOA fee includes heated SALTWATER POOL exterior insurance and exterior maintenance. Come live the Florida dream! Magnificent Views!!! Enjoy the Sunrise from your very own oceanfront balcony and watch the sunset from the exterior catwalk in this 5th floor 2 bedroom 2 bath Hutchinson Island condo featuring updated windows, new 2017 AC and recently replaced hot water heater. This place needs updating and is priced accordingly, but when you are done, it will all be done to your taste. Don't miss this chance to own a piece of your very own paradise!! 2/2 Oceanfront Condo - 2nd floor - Oceanview- Gated - Interior freshly painted - Appliances: Microwave, Dishwasher, Convection Oven, Side By Side Refrigerator ,Washer & Dryer Are Newer And Stay - All Tiles - New Accordion Storm Shutters On Balcony - New Sliding Door - Plantation Shutters In Master Bedroom - Master Bathroom Shower Redone - New Shower Door - New Mirror in Master Bathroom, New Lighting - Storage Unit - Heated Pool - 2 Tennis Courts - Private Beach Access - Car Wash Area - Clubhouse - Elevator - Pets (1) Yes But Restricted - 1 Month Lease. Furnished. 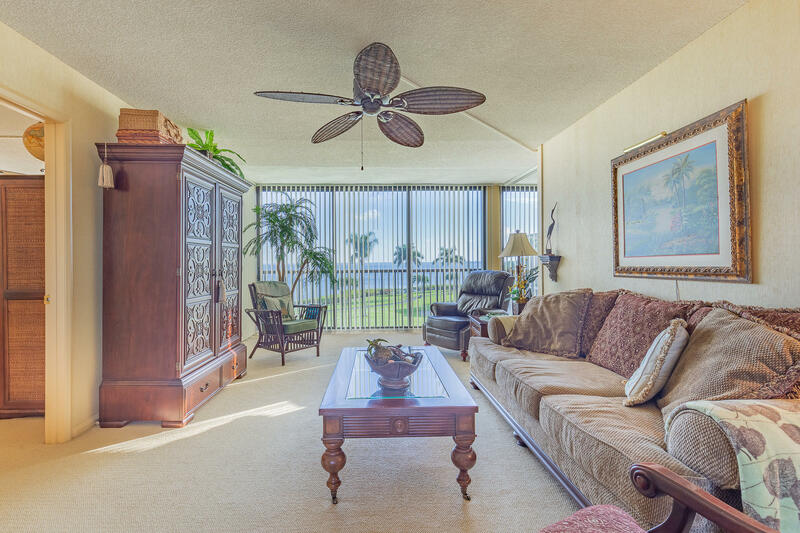 Oceanfront 2bed/2bath Condo with Spectacular Ocean views. Full length Picture glass sliders in Master Suite allowing Full Ocean Vista's and Covered Balcony Access. Desirable 4th floor. Unit has updated HVAC and Newer Water Heater. Designated Parking and Covered Portico allows for easy drop off while staying dry in Florida afternoon showers! Well appointed Community Facilities and Pool. Don't wait to call this your Beachfront Bargain and Getaway!